Apple (NASDAQ:AAPL) has been facing challenges in international regions, which has also impacted the overall sales and net income of the company. Although Wall Street is focusing on Apple’s business in China, the company is also facing significant headwinds in Europe. In the recent quarter, Apple’s revenue in this region fell by 3.5%. It should be noted that the ASP for this quarter would have been much higher than the year-ago period when iPhone X was delayed. This means that unit shipment decline in Europe could have been closer to double digit. One of the main reasons for Apple’s declining sales is the aggressive sales push made by Huawei. The market share of Huawei in this region has increased from 11.8% in December 2017 to 16.8% in December 2018. With the launch of 5G devices and newer smartphones, this market share can easily increase to 25% by end of this year. However, Huawei is now facing an increase in scrutiny from the European Union. This will impact the overall brand image of the company and could also lead to EU forming rules similar to US on Huawei. These changes should be helpful for Apple in stabilizing the revenue in Europe, especially as the company is planning on delaying the launch of 5G smartphones. Why Europe matters for Apple? We can see from the chart that Huawei is steadily increasing its market share in Europe as newer products are priced aggressively. 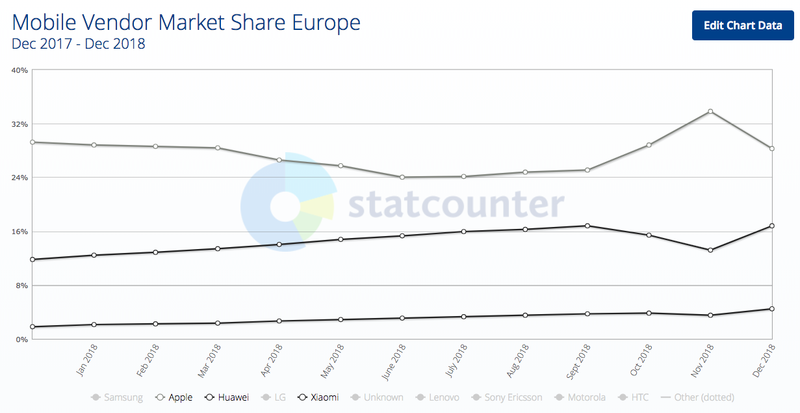 Apple’s market share in Europe is 28.35% according to Statcounter. However, within certain regions, Apple’s market share is much higher. For example, Apple’s market share in UK is 51%, and in Germany, it is 30.4%. Huawei is focusing on growth in Europe as it is almost non-existent in US market. Some of the smartphones like P20 Pro by Huawei have gained good popularity. Huawei’s main strategy is to maximize the specifications and price the devices at a very competitive price. Apple still has a solid grip on the premium smartphone market, but it is facing a huge challenge in the $400-600 price range where older Apple iPhones have to compete with better options from Huawei. Despite getting lower hype than the flagship iPhones, older models contribute a significant percentage of the total unit shipment and revenue for Apple. With the higher price points for this year’s iPhone models, it is quite likely that iPhone 7 and 8 will continue to have an important share in the total unit shipments and sales for Apple. Huawei’s P20 Pro and other new smartphones can make a significant dent in the sales of these older models of Apple. The backlash against Huawei has been gradually increasing in different regions within the European Union. Recently, an employee of Huawei was charged with espionage in Poland. As we get closer to the launch of 5G services, we should see greater resistance from EU in terms of allowing telecom networks to use Huawei’s equipment. It is also possible that EU takes a hardline position on Huawei, similar to the stance of the current administration in US. Although much of the news is about network equipment, the continuous drip of negative news surrounding Huawei would eventually affect the consumer end of the company. Huawei is planning on rolling out 5G devices and foldable smartphones in the next few months. This would be a significant lead on Apple which will probably skip the 5G rollout in this year’s iPhone cycle. German Chancellor Angela Merkel has also voiced her concerns on allowing Huawei to build a 5G network. It is likely that Canada, Australia, and New Zealand will also follow bans or restrictions on Huawei. The final trade negotiations between US and China might reduce some pressure on Huawei, but it is unlikely that all restrictions will be brought down. A broad ban on Huawei in Europe and US can also impact Apple’s revenue in China. In the recent quarter, Greater China revenue fell from $17.95 billion to $13.16 billion. This 26.7% fall in revenue has been blamed on slowing economy and a weaker Yuan. However, an increase in trade rhetoric between US and China in the last quarter has also played a negative impact on the total sales. The US government is strongly advising against the use of Huawei equipment to European Union, Canada, Australia, and other allies. This can certainly cause a backlash against Apple’s brand in China. Back in 2012, protests against Japanese carmakers led to a decline in sales of Toyota (NYSE:TM) and Honda (NYSE:HMC) by 30% to 50%. Huawei’s woes in Europe or trade negotiations between US and China that are below expectations can lead to further fall in Apple’s revenue in China. Investors should price in this factor before taking a final decision on Apple. Apple can benefit from the headwinds faced by Huawei in Europe. Huawei has been able to increase its market share in Europe to 16.8% and can increase this to 25% by year-end if the current growth trajectory continues. Europe contributes 24% of the total revenues for Apple. Huawei has been giving tough competition to Apple in the mid-tier price range of $400-600, which can hurt unit shipments of older models from Apple. If European Union announces a broad ban on 5G network equipment from Huawei, it will also have a negative impact on the consumer electronics segment. Apple can see good tailwinds in the markets where Huawei will face additional restrictions.